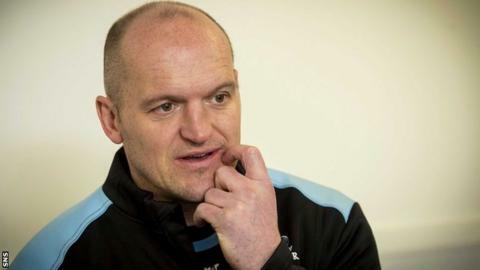 Gregor Townsend says his Glasgow Warriors side are relishing the prospect of their "massive" Pro12 clash against play-off rivals Ulster. The sides meet at Scotstoun on Good Friday, with Townsend's men five points behind their opponents in the table. "We've got four games left of the regular season," the head coach told BBC Radio Scotland. "If we do well in those games then we'll finish in the top four places and back in the play-offs," said Townsend. "This is the most important part of the season. Ospreys aren't far off the top four as well and they've probably got three games they can win. "Ulster have Munster and Leinster after they play us tonight, so teams will be taking points off of each other. "It's so important we get the win tonight. Our games have been really competitive over the last couple of seasons and the weather's going to be great. "We're hoping for a really big crowd to get behind us. We've got two big stands up at either end of the pitch, ready for the Sevens in a couple of weeks time. "The pitch is looking great and we can get a good walk-up crowd as well. On Good Friday, we're hoping to get more than 7,000." Peter Horne will start his first game for Warriors since the play-off defeat by Leinster last May. "We take selection very seriously and try to reward form as well as picking a team that puts us in a position to win," said Townsend. "Bringing Peter Horne back is a big boost as he was one of our best players last year. "He's been working hard since his knee injury and deserves to start."